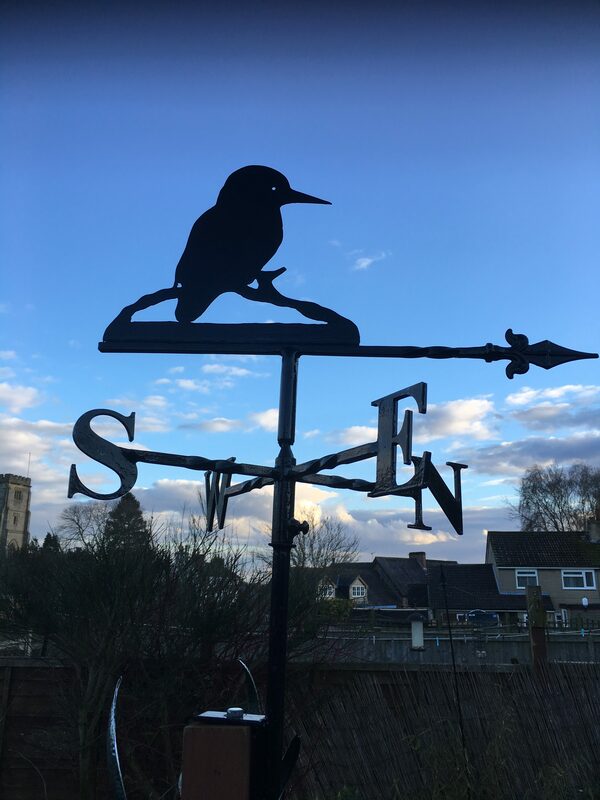 Kingfisher weathervane handcrafted by Chris Clarke, a traditional blacksmith with over 20 years experience of producing beautiful, high quality ironwork. 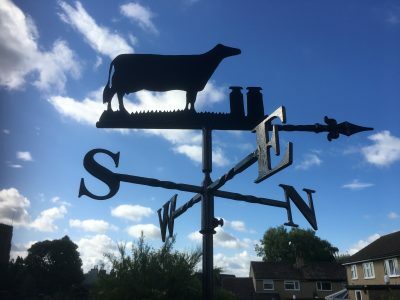 Weathervanes have been around for hundreds of years and are a traditional symbol of British countryside life. Traditionally weathervanes have been mounted on the gable end of a house, garage or other solid structure. 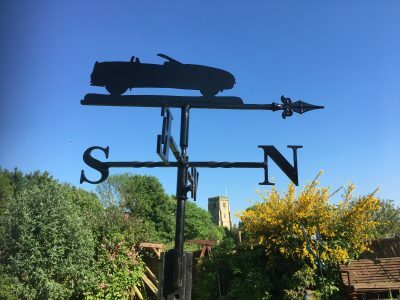 As more and more people are acquiring these beautiful, as well as useful, items for their home, we can supply vanes with ridge fittings, roof fixings or with a post fitting so that the vane can sit on a post in the garden, visible to those inside the house. 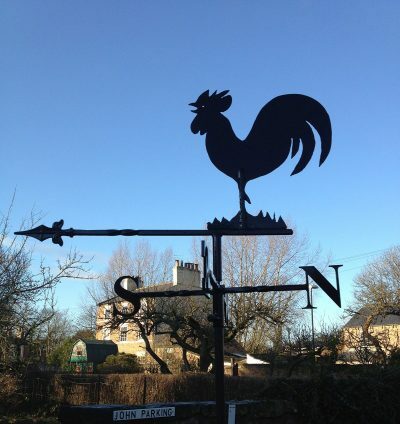 We make all sorts of weathervanes from the traditional cockerel, through to birds, animals, occupations, hobbies and vehicles. 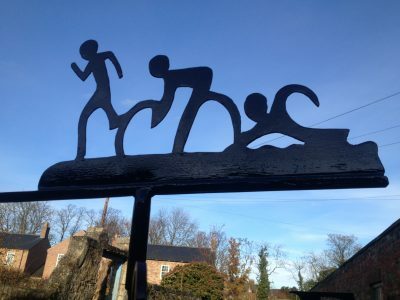 Alternatively, bring us your photo’s or pictures and we will make a truly unique and bespoke vane for you. If you don’t have a picture but you do have a great idea, talk to us and we will source and design a vane for you. The only limit is your imagination – so far nothing has been impossible! We balance our weathervanes on knife edges in the making, and they rotate on a free running, single ball bearing. They are finished in a high quality, weatherproof black gloss produced locally in North Yorkshire. All of this results in a weathervane that will work accurately and trouble free, and last a lifetime. 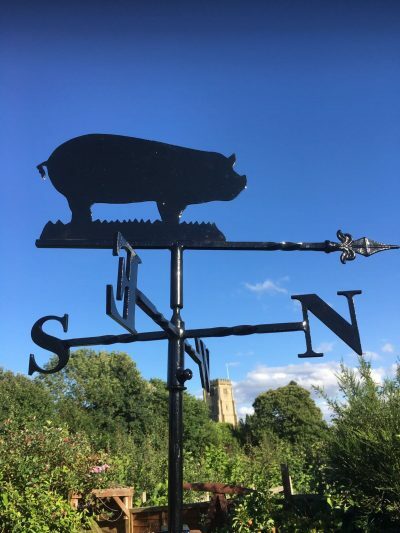 With regards to size, a medium vane (our most popular size) measures 21″ (54cm) across the cardinal points and is approximately 25″ (63cm) tall from the wall mounting to the bottom of the motif. This does not include the height of the motif which of course will vary depending on the design. The offset from the wall is 3.5″ (9cm) as standard but we can always make this more or less if needed. Chris cuts all our weathervanes by hand and they are fully welded, with no flat packs to screw together. The vane comes well packaged in a large box containing 3 pieces – the upright stem, the NSEW and the motif, plus bolts and screws for fitting. We include an instruction sheet in the box which explains the simple procedure to install the vane. 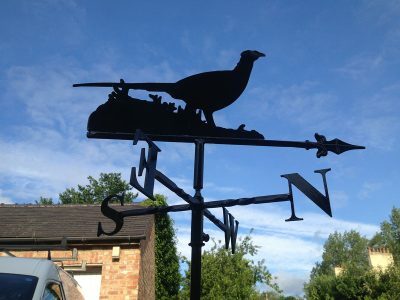 The weathervanes in our “standard” section are usually already made, to be despatched within 3-5 working days. However, sometimes we may sell a few of a certain design and we will have to make a new one for you, resulting in a slightly longer delivery time. Bespoke items are all made to order and usually take between 2-3 weeks depending on the order books! A quality, handcrafted item is always worth the wait in our opinion though!